Intel has also been putting some effort on the software side for the Compute Stick platform. One of the main problems with the platform is the limited availability of USB ports. In addition, the use-cases often tend to rule out wired I/O peripherals (keyboard and mouse). However, in certain situations (such as the 'entertainment' use-case), the consumer often has a second screen available (either a tablet or a smartphone). 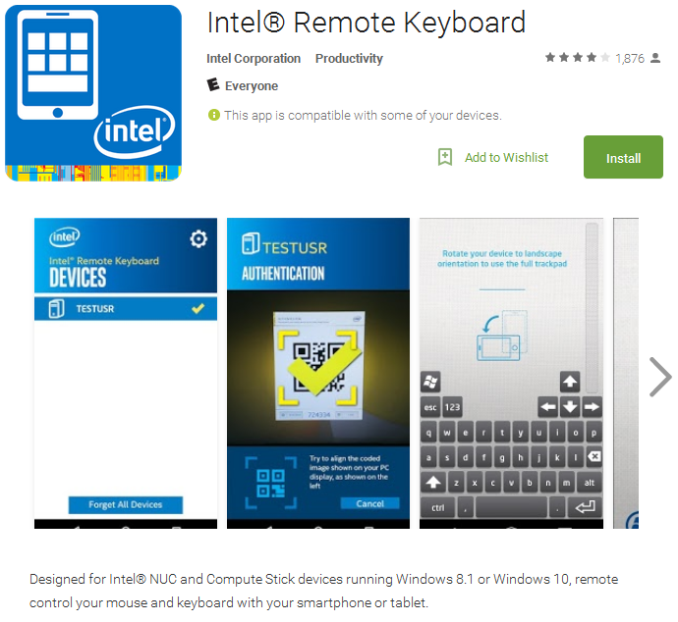 Intel has a free Android / iOS app - the Intel Remote Keyboard - to take advantage of the second screen. The host application comes pre-installed on the Compute Stick and is active at startup as a service. Therefore, one can use it to even enter credentials for system login. It allows the second screen keyboard to act as the primary keyboard for the Compute Stick and the screen itself to act as a trackpad for the mouse pointer on the Compute Stick's display. In our evaluation, the app worked well. Our only wish is for the in-built keyboard in the app to have a 'Tab' key. Moving on to the business end of the review, we complained in our Bay Trail Compute Stick evaluation that 32GB of primary storage does not cut it on any computing device other than a tablet or smartphone. Unfortunately, the Cherry Trail Compute Stick doesn't solve that problem. Initiating Windows update after boot-up installs the latest build. However, after the whole process is done, Windows basically backs up the previous install in Windows.old. It leaves only 5GB of free space in the eMMC drive (no other programs installed). One needs to manually run Disk Cleanup to remove the previous installation. In the meanwhile, performance suffers. On top of that Windows loses its activation status in the update and refuses to activate. More importantly, the latest build doesn't have the Wi-Fi drivers for the machine. So, the unit can't communicate with the network at all until the the WLAN drivers are downloaded on another machine, brought in to the Compute Stick via USB and installed manually. 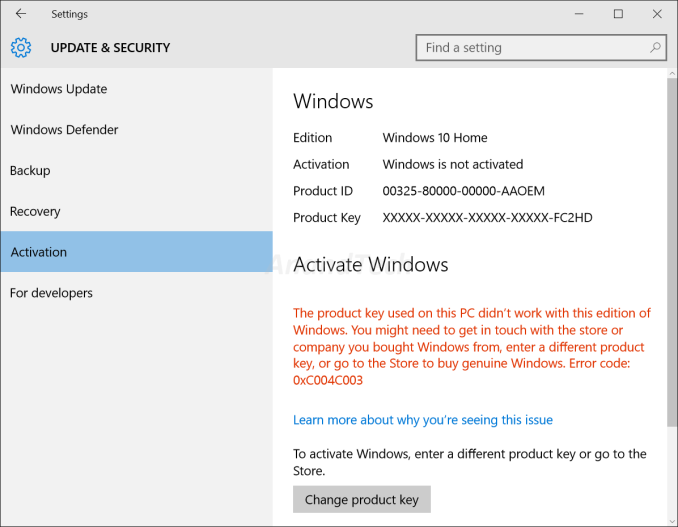 It is surprising that the AC7265 drivers are not part of the Win10 update installation. Coming to the thermal solution, the fan curves are very annoying. In a quiet room, the fan kicks on and off randomly (depending on the CPU temperature and load), and the sudden whine is not pleasing at all. It is very similar to the Bay Trail Compute Stick in this respect. That said, most of the time, the unit is quite silent - almost as if the fan is not running at all. On the plus side, it is very nice to get a 2x2 AC7265 802.11ac WLAN card in the unit. The improved GPU along with the updated media playback capabilities is also very welcome. CPU performance is not improved much over the Bay Trail version, but the Core M Compute Sticks due later this year should help address that aspect. 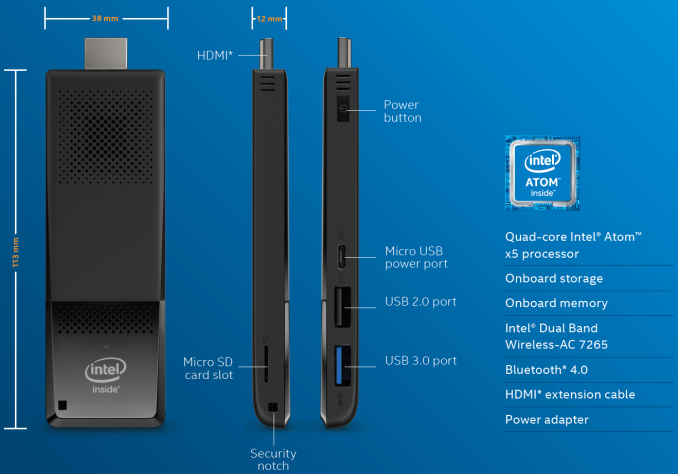 Intel has been listening to feedback on the Bay Trail Compute Stick and the Cherry Trail iteration has managed to address many of the problems. A few still remain, but there is no reason why these Compute Sticks can't become as popular as the NUC a couple of generations down the line.